Outstanding design and performance features of the 36' (11 meter) PF 36 Limited Edition include a Duo-Delta Conic hull design, which stealthily incorporates two hulls into one for the optimal stability, handling and speed. Twin Mercury EU662sci and 662HP engines, 494 kW each - the highest horsepower marine sterndrive engine available for sale in the EU, power the craft to a top speed of 90-95 mph. 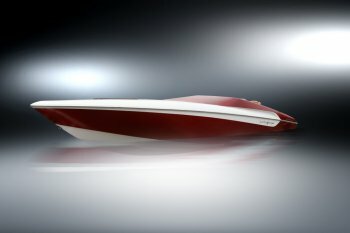 Pininfarina Extra, the product and interior design arm of Italian design pioneers Pininfarina, in collaboration with US powerboat manufacturer, Challenger Powerboats, Inc., will launch the new and exclusive PF 36 Limited Edition Powerboat at the Miami International Boat Show on February 14th, 2008. The sleek vessel is designed with the technical attributes of Challenger's race-calibre powerboats, coupled with the revolutionary styling of Pininfarina, a name synonymous with the finest Italian sports cars, from Ferrari to Maserati. On the eve of the much anticipated launch, Pininfarina Extra President and CEO, Paolo Pininfarina, said, "Working on this project, our goal was to design a prestigious sports boat in which the focus would be on freedom -- freedom to navigate a boat that combines the stunning beauty of avant-guard styling with the reliability and performance available from today's technologically advanced engineering. On the PF 36, sportiness and style blend to create unique and distinctive lines, in complete harmony with the nautical landscape." - A Duo-Delta Conic hull design, which stealthily incorporates two hulls into one for the optimal stability, handling and speed. - Twin Mercury EU662sci and 662HP engines, 494 kW each - the highest horsepower marine sterndrive engine available for sale in the EU. - A top speed of 90-95 mph. - A fully loaded cabin outfitted with the latest Cantalupi LED RGB adjustable indirect lighting controlled by touch screen, flat screen TV, DVD and iPod ready sound system, a bar complete with sink/refrigerator and Dock Side air-conditioning, finished with luxe Pininfarina styled upholstery. - Pininfarina styled Bolster seats in the cockpit. PF 36 Limited Edition lead designer and Pininfarina USA Vice President and Managing Director, Franco Lodato, said, "Performance, styling and innovation are the key points we wanted to express in the design of this boat. We approached these issues from a unique perspective and sought to re-think the whole experience around power boating. The result: a powerful, yet stylish ride." With the introduction of the PF 36 into the American boat market, Pininfarina Extra seeks to infuse Italian style sensibility with the brute strength and expertise of American boat design, and follows Pininfarina Extra USA's celebrated success in private aviation and hotel design. Pininfarina Extra is a division of the Pininfarina Group, specialising in product and interior design, from yachts and private aircraft in the transportation industry to designs in the electronics, consumer, home and office, sport, and architecture and interiors industries. Based in Turin, Italy, Pininfarina Extra's US flagship office is in Ft. Lauderdale, Florida. Founded in 1930, Pininfarina is known for its cutting-edge designs, primarily of sports cars, most notably Ferrari and Maserati. Headquartered in Turin, Italy, the Pininfarina Group employs more than 3,000 talented individuals throughout the world and has operations in Italy, France, Germany, Sweden, United States, Morocco and China. Challenger Powerboats, Inc. designs and manufactures high performance 'go fast' offshore racing boats, family sport cruisers, jet boats and water ski tow boats under the brands 'Challenger Powerboats', 'Sugar Sand' and 'Gekko', which target the recreational boating market. Proven world-class technology is incorporated into the manufacturing of our award winning boats at the Company's 65,000 sq. ft. facility located on our 12 acre complex in Washington, Missouri and 80,000 sq. ft facility in Fargo, North Dakota. The Company's boats are sold through our dealer network in the United States, Canada, Mexico, Europe, Australia, the Middle East and Japan. In 2006, Gekko was selected as an official tow boat for the World Barefooting Championships, and the European Barefooting Championships in 2005.